Movistar Yamaha MotoGP riders Valentino Rossi and Jorge Lorenzo kicked off the action in America today with two challenging free practice sessions ahead of this weekend‘s Grand Prix of the Americas. 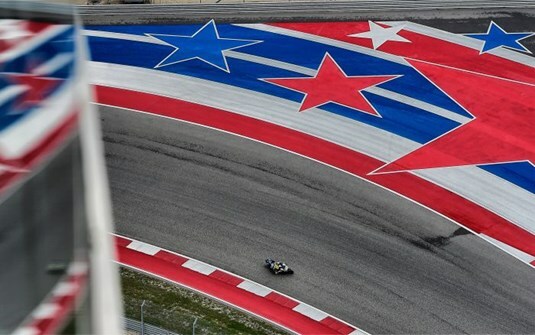 The first practice at Circuit of The Americas (COTA) was full of surprises. Rossi and Lorenzo initially battled themselves up to provisional 3rd and 13th respectively in a soaking wet morning session, but just 12 minutes into FP1 the red flags came out after a dog ran across the track, delaying the session by 20 minutes. Once the session re-started, nine-time World Champion Rossi returned to the track and was able to better his time to a 2‘20.593 for a fourth place. He further improved his time in the afternoon. As dry patches started to form, he made the most of the last 18 minutes of track time and clocked a 2‘05.691. His time put him in sixth place, 0,856s from the front. Teammate Lorenzo kept his caution in the first free practice as he struggled with a lack of rear grip, causing him to finish in ninth place with a 2‘21,486 lap. As the track dried out during FP2, the Spaniard gradually reached a personal best of 2‘06.174. He holds eleventh in the combined times, less than five tenths of a second from his teammate in sixth place. Pol Espargaro kick-started his round 2 campaign at the Circuit Of The Americas by delivering a solid performance to finish in 7th overall on the opening day in Texas. The first practice began in difficult circumstances with a heavy downfall of rain as well as a red flag causing disruptions to the practice. Nevertheless, Espargaro powered onwards and completed FP1 in 7th place with a best time of 2’20.983. The weather improved in the afternoon, which permitted the riders to revert to slick tyres and the 2014 rookie of the year continued to push as he set up his Yamaha YZR-M1 for the 21 lap sprint on Sunday. The end of the session saw Espargaro meet the chequered flag in 7th with a best time of 2’05.840 and a performance that saw him under three tenths back from 4th. The young Spaniard’s effort today leaves him optimistic of improving his pace in tomorrow’s free practice session before the all-important qualifying. On the other side of the Monster Yamaha Tech3 Team garage, Bradley Smith battled throughout the day as he attempted to assert himself as the leading satellite rider in Texas. The 23 year old completed the first session of practice in 6th position in wet conditions at the Circuit Of The Americas and was confident of progressing in the afternoon. In FP2 the young Briton set a best lap time of 2’06.134, yet unfortunately suffered a fall in the following lap which prevented any chance of climbing up the rankings. Despite this, Smith completed the day in 10th position with his time being only three tenths behind his teammate. Tomorrow the British rider will intend to bounce back and have a competitive qualifying session aboard his Yamaha YZR-M1 in view to Sunday’s race. It was a good start with a positive eighth place and the head of the Open category for Stefan Bradl and the team Athinà Forward Racing at the Grand Prix of the Americas in Austin, Texas. After an unusual first free practice session with rain and a red flag – exposed for ten minutes due to an invasion of the track by a dog – in the afternoon the German rider posted a personal best of 2.05.990, which earned him the top of Open category and eighth place overall. Bradl is confident for the qualifying and his goal is the pole position of the Open class. It was a harder debut at COTA for his teammate Loris Baz. The Frenchman, who will try to approach the Top15 tomorrow, with the time of 2.09.372, finished in 23rd position.